Being the first time since ICOMOS’ founding that the 17th General Assembly has taken place in the French capital, Mr. Pierre-Antoine Gatier, President of the 17th General Assembly and Chairman of the Organizing Committee, expressed particular satisfaction at the success of the 2011 Paris event. Preface: The Valletta Principles for the Safeguarding and Management of Historic Cities, Towns and Urban Areas (2011) , also known as “The Valletta Principles“, was adopted by the 17th ICOMOS General Assembly, Paris, 28 November, 2011. ICOMOS, the International Council on Monuments and Sites, held its 17th General Assembly and Scientific Symposium in Paris, at UNESCO headquarters from 28 November to 1 December 2011. Held under the high patronage of Ms Irina Bokova, Director General of UNESCO, and Mr Nicolas Sarkozy, President of the French Republic, this event gathered 1150 participants from 106 countries, and saw 77 ICOMOS National Committees represented. A generous grant from the Getty Foundation and the ICOMOS Victoria Falls Fund supported 63 professionals from 47 countries to attend this General Assembly. This record attendance was noted by all, especially by Mr. Gustavo Araoz, President of ICOMOS, who made particular reference to this in his introductory remarks. 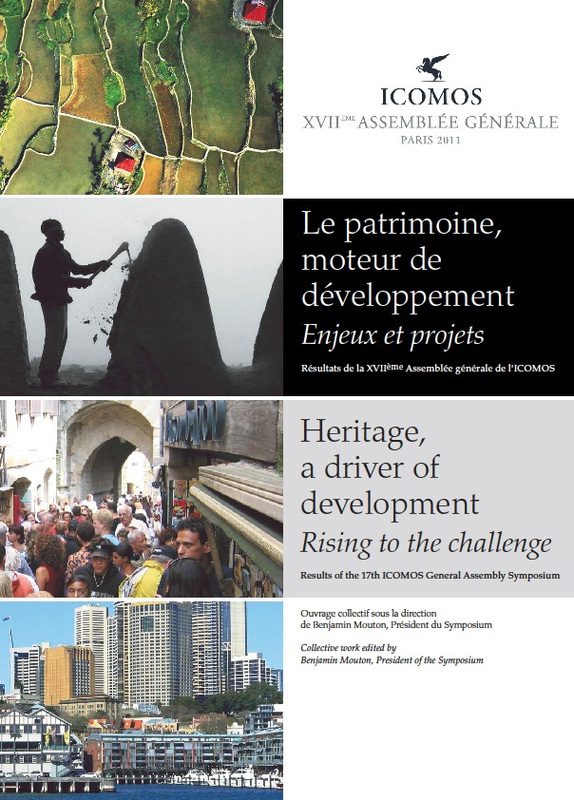 The General Assembly adopted two new doctrinal texts, which complement the existing set of Charters which ICOMOS has been promoting since its first General Assembly in 1965 in order to provide guidance to authorities, institutions, experts and any interested stakeholder in their action for the conservation and enhancement of heritage sites. – the Valletta Principles for the Safeguarding and Management of Historic Cities, Towns and Urban Areas. It also adopted the Paris Declaration on Heritage as a Driver of Development resulting from the discussions during the Scientific Symposium, as well as 46 resolutions (The final communiqué of the General Assembly can also be consulted on the ICOMOS website or the Reference section of this post), concerning organisational ICOMOS matters such as the adoption of new Rules of Procedure for the General Assembly, but particularly on newly emerging heritage issues, for example in connection with human rights and peace, and situations affecting specific monuments and sites. Over 150 speakers came to present their papers. Of good scientific merit, these provided fuel for discussions during the various Symposium sessions, and for the first time in workshop-debates, held during the lunch breaks, which allowed a larger number of contributions to be heard. The prevailing idea was to promote exchanges between students and to integrate them more closely in the conduct of the General Assembly, to consider them as professional partners in their own right and associating them closely in the development of the Scientific Symposium’s conclusions. Also with the aim of promoting exchanges and better mutual understanding, a Forum of the ICOMOS International Scientific Committees was organized during the General Assembly. The International Scientific Committees were given the opportunity to present their activities, an offer which was met with great success. Several ISCs also held their regular annual meetings during the duration of the General Assembly. During the 17th General Assembly, the partners who supported its organisation were invited to participate in the sessions and the discussions of the Scientific Symposium. They were furthermore offered the opportunity to present their work in the Exhibitors Forum which gave rise to fruitful exchanges. 28 November -1 December, 2011. The 17th ICOMOS General Assembly, Paris, 28 November, 2011. The Valletta Principles nominate ‘heritage as an essential resource, as part of the urban ecosystem. This concept must be strictly respected in order to ensure harmonious development of historic towns and their settings’. The main objective is to propose principles and strategies applicable to every intervention in historic towns and urban areas. These principles and strategies are meant to safeguard the values of historic towns and their settings, as well as their integration into the social, cultural and economic life of our times. These interventions must ensure respect for tangible and intangible heritage values, as well as for the quality of life of inhabitants. For the safeguarding of historic towns and urban areas and their settings, it discusses: definitions; aspects of change and challenges; intervention criteria; and proposals and strategies. Hutchings RM and Dent J (2017) Archaeology and the Late Modern State: Introduction to the Special Issue. Archaeologies, Springer US 13(1): 1–25. Shchenkov A (2016) Problems of originality of small historical cities of Russia. Procedia Engineering, Elsevier B.V. 165: 1021–1026. Hosagrahar J, Soule J, Girard LF, et al. (2016) Cultural Heritage, the UN Sustainable Development Goals, and the New Urban Agenda. International Council on Monuments and Sites (ICOMOS), ICOMOS. Plets G (2016) Heritage bureaucracies and the modern nation state. Towards an ethnography of archaeological systems of government. Archaeological Dialogues 23(2): 193–213. Lardinois S, Ana Paula Arato Gonçalves LM and Macdonald S (eds) (2015) Contemporary Architecture in the Historic Environment: An Annotated Bibliography. Los Angeles: The Getty Conservation Institute. Veldpaus L (2015) Historic urban landscapes: framing the integration of urban and heritage planning in multilevel governance. Eindhoven: Technische Universiteit Eindhoven. Musteaţă S (2014) Archaeological Heritage Crimes in Romania and Moldova: A Comparative View. In: Grove L and Thomas S (eds), Heritage Crime:Progress, Prospects and Prevention, London: Palgrave Macmillan UK, pp. 71–80. Veldpaus L and Roders AP (2014) Learning from a Legacy: Venice to Valletta. Change Over Time 4(2): 244–263. Grevtsova I (2012) Approach to the general problems of the cultural heritage in urban contexts. Heritage & Museography 4(3): 78–84. Demoule J-P (2012) Rescue Archaeology: A European View. Annual Review of Anthropology 41(1): 611–626. van den Dries M (2011) The good, the bad and the ugly? Evaluating three models of implementing the Valletta Convention. World Archaeology 43(4): 594–604.